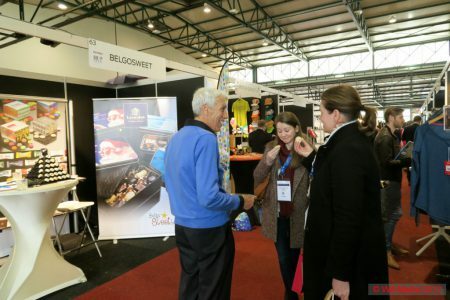 BelgoSweet.be will be present at the following Trade Fairs at home and abroad. List shown below. For us it is always a pleasure to welcome you to our fairs, both in Belgium and abroad in order to present you our latest products. Leonidas, Godiva, Guylian, Chocopolis Jules Destrooper, Mentos, Jelly Belly and regional specialties such as Belgian Cuberdons / noses, Calissons Provence and Macarons we printed in our own company with your logo. Give us a call and we inform you at what booth we are at the trade fairs. We are always searching for that particular product that makes a difference, with which you can surprise your customers and business contacts. Belgosweet THE specialist of personalized chocolates, candies and cookies from the best brands. And considering we print a number of products ourselves we can deliver quicker. Our many re-orders show that our customers appreciate our beautiful products. And that is why we do it, of course, because a satisfied customer always returns.